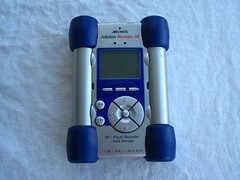 Archos Jukebox Recorder 20, R.I.P. First off, a warning to you all: This is the geekiest thing you’ve seen yet on this blog. It’s certainly geekier than my scooter mileage entries; I actually think it’s more on the level of the entry I wrote about socks nearly a year ago. But maybe it’s worse than that. In fact, I fully expect most of you to quit reading immediately. It’s also terribly long. If you make it to the end of this crazy thing, you should make a comment or something to prove it. Last Sunday, I said goodbye to my Archos Jukebox Recorder 20. That’s the last picture taken of it, at the top of this blog entry. It finally quit functioning entirely, and it didn’t seem like I was ever going to be able to get it working again, at least not without ordering parts from weird electronics stores on the web and learning how to solder. And maybe not even then. All signs were pointing to complete hard-drive failure. So I had to let it go. I swear I have good reason to be emotional about this. I’ve owned my Archos Jukebox since late 2002; I bought it at Costco after much shopping and deliberation. 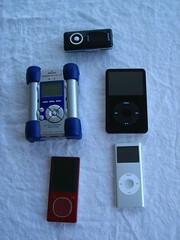 It was not the first “portable” MP3 player I owned. I had a Pine D’Music CD MP3 player I bought from a friend, for which I burned genre-specific CDs full of hundreds of songs, but I had to plug it into the wall for it to play more than, say, 15 of them, because it ate through batteries at lightening speed. So, it was small, but not exactly portable. The Jukebox Recorder was a perfect upgrade; it was an awesome early competitor to the iPod. I loved mine. It might not have had the slick case and great navigation, but it had more storage, a cheaper price, great sound, good battery life and user-replaceable batteries, recording capabilities, and, best of all, it required no software install on your PC to listen to music. I’d just drag my MP3s over to the player’s drive, and they played. I could put them in folders to organize them, or not. It just worked. And, uh, it was huge and heavy. If I decided to drop it in my pocket and take a walk, I generally had to wear a belt. Of course, if I had been attacked on the trail, the Archos Jukebox Recorder 20 would have made a formidable weapon. Did the “20” in its name refer to its gigs of storage, or its weight in pounds? Still, it was nearly a constant companion, adding its weight to nearly every bag I carried. But I’d been having trouble with it for awhile. In about 2004, the battery life began to falter, so I upgraded the firmware to RockBox open source firmware, which really breathed new life into it. When the battery life started to slip again, I switched out the factory batteries for new, higher-capacity batteries, which once again helped. But, little by little, the battery life started to go again, and it became clear that this was no longer a portable machine. That didn’t mean I didn’t use it; I packed 20GB of music on it and took it to work and plugged it it, where it became my main source of office tunes. But, finally, right after we moved here, I plugged it in expecting to use it as a backup drive for my also-rather-ancient Sony Vaio notebook. When I started it up, and the hard-drive error you get when the battery is low popped up, even though it was plugged in. I got it past the error, but the drive kept making sad, squeaky noises, and I couldn’t write to it. I finally unplugged it and put it in a box, and tried to forget what had happened. Which brings us to last weekend. An elementary school in my neighborhood was having an e-waste collection day, so I decided it was time to make some hard decisions. I had already pulled the batteries out to see if they were still good — they weren’t, couldn’t be recharged at all — and so I tried once again to bring the Jukebox to life via the wall wart. It was even less responsive than the last time — all I got was the backlight, and that didn’t work consistently. The end had come. Of course, it’s not like I don’t have a digital media player to replace the Archos. In fact, I’ve had many DAPs since the days that the Archos’ battery started to fail. First, I bought a 4th generation iPod from HP, which was a nightmare from start to finish, and which I finally sold. I replaced that with 2 GB Sansa C150, which I actually wrote a review of once. It had an option to use drag-and-drop for loading music files, but it’s a little awkward to use in general; however, if you’re in a situation where replacing batteries would be easier than recharging via USB, this is still a handy player to have, with nice sound. I eventually got over my iPod trauma when I got a really good deal on a 30 GB 5th gen iPod, which became my new big hard drive player. Since then, I’ve also acquired a 2 GB iPod Nano, which is my running player now (with Nike +! ), and a Zune 8GB player, which I think is a player with awesome potential. The Zune is really my current favorite; and, of course, my newest. Here’s all of the players I still own, hanging out with the Archos Jukebox one last time. So, you’d think this would be the end of this entry. But it’s not; it goes on. In order to distract myself from the loss of the Archos, I decided to buy myself something new. 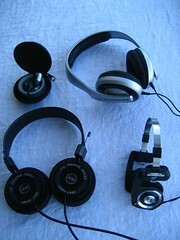 It was related purchase: a pair of Koss PortaPro headphones. I’ve been jonesing for these retro-looking headphones for a while, mostly because they remind me of the old Koss Sound Partner headphones. You see, sometime in the 1970s, my father had gone on a business trip and brought back a crazy huge yellow plastic headphone/radio combo for me. I loved this thing. It’s one of those objects that I can remember everything about — how it felt to expand the headphones, which slid apart so you could fit them on your head; where the dials and the knobs were; the sound it made when it clicked on and off; the way it felt pressed up against my ears. And, of course, it gave me my own private soundtrack. I think that perhaps it was this piece of equipment that began my electronics obsession. Boy, I wish I still had that headphone radio. It was a hoot. My parents let me buy this setup using “Big Bonus” stamps from the grocery store. It was awesome, except that the Sound Partner headphones had an Achilles’ heel — the connection between the earpieces and the cable. My first pair quit working pretty quickly, and I was very disappointed. Koss ended up replacing them — Koss products have a lifetime warranty! — with a fresh pair of Sound Partners in the box, which came with a cloth carrying case. I’m sure my mother must have done the talking on this, I certainly can’t imagine myself at 11 calling up a 1-800 number and bitching about my broken headphones. I don’t remember what happened to these in the end, but one thing stood out to me about the Sound Partners — they sounded good. Their sound quality was head and shoulders above the headphones that were stuck in the boxes with subsequent Walkmans and the like that I owned. It wasn’t until a few years ago that I realized that, although Koss discontinued both the Music Box and the Sound Partner well before Reagan was out of office, one 80s varient of these stereophones is still in production – the PortaPros.